Many choices of glassware to rent... from cubes to tower vases. A great way to get fabulous arrangements with an affordable budget. 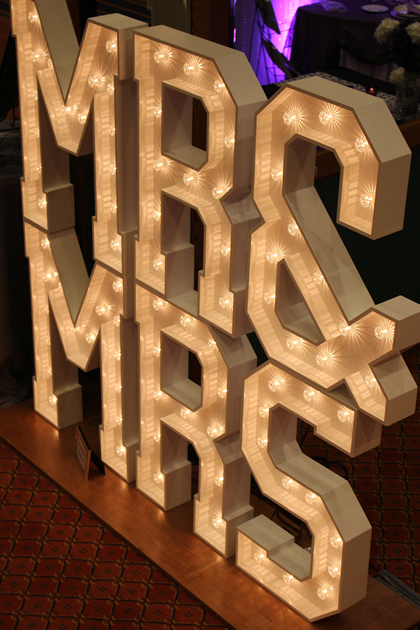 MARQUEE RENTALS - Our marquees are a fabulous addition to any reception! These unique piece are big, bold and make a beautiful statement. 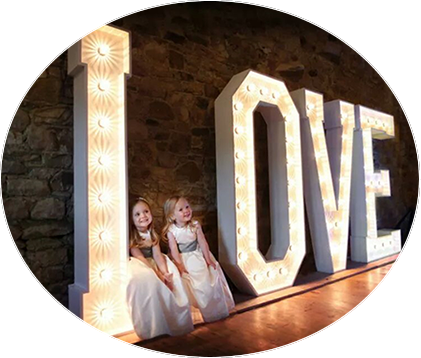 The LOVE Marquee is 6ft tall and 16ft wide. They make wonderful backdrops for a sweet heart table, along a dance floor or as a grand entrance piece. You and your guests will enjoy all the beautiful and fun photo opportunities. BROOCH BOUQUETS - (Gallery) These bouquets are timeless pieces made of both new and vintage brooches, an elegant twist on your traditional bridal bouquet and brides maids too! Described as the ultimate in "bling", these hand made one of a kind bouquets are custom made just for you. A unique way of expressing your personal style. 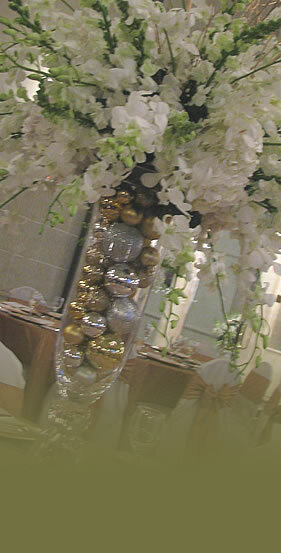 The featured bouquet is designed primarily with all silver and rhinestones with a splash of color. It also includes many heirloom pieces from family members and special friends. An extra personal touch was the addition of photo brooches which served as a memorial tribute to loved ones and also featured a special memory for the bride and groom. The bouquets can be created in in two ways, either with a collection of your own pieces or we will hand pick each piece for you with the option of adding any special heirloom pieces. We suggest ordering 6-9 months prior to your event, however if you have a short deadline we will try our best to accommodate. Brooch designs include: Bridal bouquets, Brides Maids, Flower Girls, Mother's clutch or handbag pieces, boutonnieres and cake tops.